Pneumonia is the inflammation of one or both lungs in the chest, usually due to infection. It causes disruption of the normal process of gas exchange, where oxygen is taken into the body and the waste product carbon dioxide removed. This causes interruption of oxygen supply to the tissues which is potentially fatal, but thanks to modern antibiotics, many people, young and old, now make a good recovery. However, it's still a common cause of death among those who are seriously ill.
• Sudden onset of high fever. • Sharp stabbing chest pains, especially on coughing or deep breaths. • Cough producing unpleasant sputum, which may be green, rusty or blood stained. Symptoms vary depending on the cause. In older people, symptoms may be vague, for example their temperature may be only slightly raised or even normal. Confusion may be the only clue something is wrong. Many different bacteria, viruses and fungi causes pneumonia. 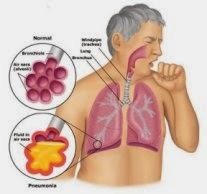 One of the most common is Streptococcus pneumonia. Other common causes include haemophilus and staphylococcus. More unusual bacteria are sometimes found, especially in people with underlying problems with their immune systems. Bacterial pneumonia is the most common form of pneumonia in adults and is usually more serious. It may be a secondary complication of a viral respiratory illness such as flu, especially in people with immune deficiencies. Respiratory viruses are the most common cause of pneumonia in young children up to school age. Fungal pneumonia is almost always linked to an immunodeficiency. Inhalation pneumonia is due to inhalation of foreign material, such as food or vomit (for example if someone falls unconscious or has a stroke and so loses the normal control that protects the airway). Some types of pneumonia are known as atypical. These include infections caused by certain bacteria, such as Legionella pneumophila, Mycoplasma pneumoniae and Chlamydia pneumoniae. Some atpycial pneumonias are milder, with a more gradual onset and less severe symptoms than might be expected from the x-ray. Others, such as legionella, have a high mortality. Mycoplasma pneumonia is a common in children and may be associated with non-respiratory problems, such as rashes, anaemia or meningitis. In younger people, factors such as smoking, heavy drinking, chronic lung disease or underlying illness can sometimes increase their risk. Older people are at particular risk, as are people in hospital because of a combination of general illness, immobility and the presence of many more resistant bacteria within the hospital environment. A prompt diagnosis is vital and involves tests such as chest x-rays and examination of sputum in the laboratory to identify the micro-organism causing the illness. Bacterial pneumonia can be treated with antibiotics, and anti-fungal treatments can be given when a rarer fungal cause is suspected. Although antibiotics aren't effective against viral pneumonia, they may be given initially until the cause is confirmed. Oxygen may be needed to help breathing and raise oxygen levels in the body. An intravenous drip may be used to give fluids if the person is dehydrated. Sometimes pneumonia can be treated at home with a combination of antibiotics, rest, plenty of fluids and paracetamol, ibuprofen or aspirin (children under 16 shouldn't be given aspirin). Without treatment, mortality from bacterial pneumonia may be as high as 40 per cent. Among older people mortality may be higher than this, even when effective treatment is given. Complications such as lung abscesses can follow pneumonia, so always seek further help if someone who appeared to be recovering relapses. Vaccines are available to prevent some types of pneumonia. Pneumococcal vaccine prevents S. pneumonia and HiB prevents pneumonia in children caused by H. influenzae type B. The influenza vaccine prevents flu and infections such as pneumonia that can complicate it. It's routinely offered to high risk groups such as those over 65.